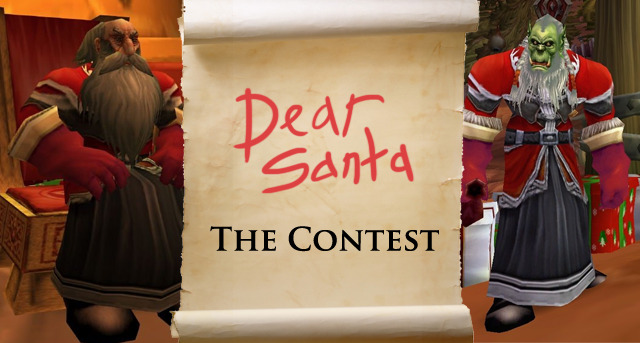 Time to announce our winners of the contest! I know it may be June, but it's Winter Veil somewhere! (My childhood refuses to believe this isn't true) It's always hard to judge these contests, that I kick myself for getting into these situations every time. That said, I have made my decisions, which I stand behind in terms of being amazing. The first up is Filthy Haiku, who has brought us the classic tale of brothers celebrating the season. Gall was just too adorable and Cho provided a great balance for him. All-in-all, fantastic characterization and pictures! tzirean's entry nearly made me cry when I remembered poor Arator's tale. It's like Tiny Tim, except that you know that Blizzard will never ever fix his life. Someone go deliver that guy a hug or something. Finally, we have Taoto's entry. It's short, sweet, and just amazing. Seriously, what is up with those sheep? Having a little burnt scrap of paper makes this all the better. I just love the extra effort. For all of your hard work, you all receive Chieftain Necksmasher's Spirit of the Season Medal! Can't wait to see what everyone chooses!